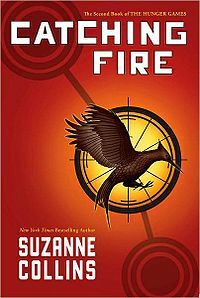 blo Teens Read and Write: Lots of Catching Fire Giveaways! Loved Hunger Games? Then you're probably waiting impatiently for it's sequel, Catching Fire. You're in luck because there happens to be several bloggers giving away the book and some other fun stuff in a whole prize pack. They're listed on our sidebar but here are some links as well. Feed Your Imagination - ends 9/5 so hurry! Thank you thank you for this heads up! I'm on my way now. Go Juju! Hope you win one! Am I a total nerd for thinking winning the pin would be totally cool too?